Sieve shakers are used to measure particle size as part of your research or quality control applications. Sieve shakers provide uniform motion to ensure the reproducible results you can’t get from hand sieving. 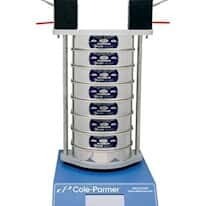 Shakers are available with amplitude control and timers allowing you to standardize your procedure for reliable results.